Hello everyone! I hope you're having a merry Christmas with your loved ones. 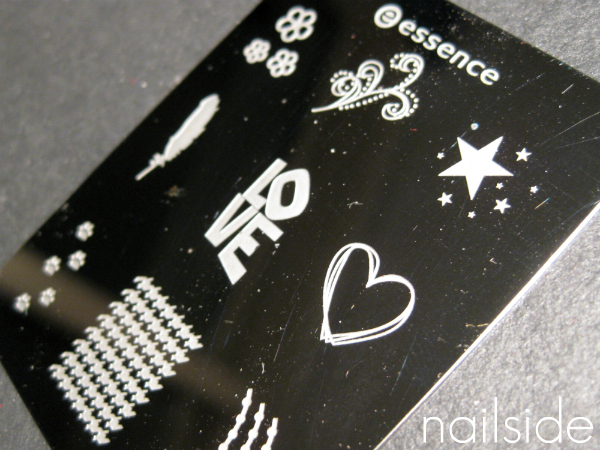 This year I'm rocking this star pattern that I made with a new image plate from Essence. It's only available in a set including a stamper and scraper, which I already have, but I really wanted the star design. The star shapes I have on other patterns are quite small which makes them harder to work with and less recognizable. (And besides, €3 for the whole set is a pretty good deal!) 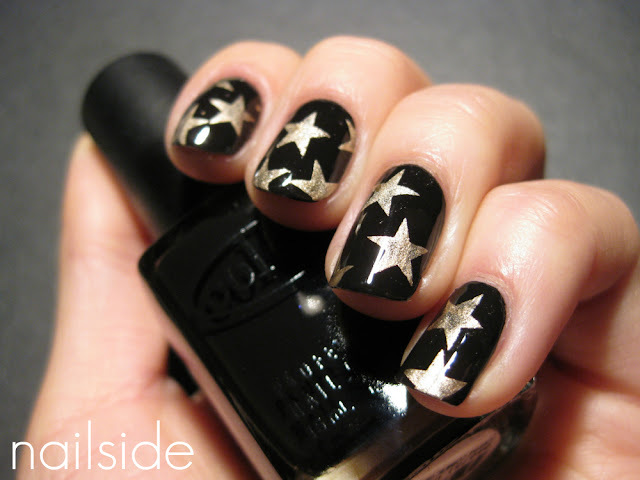 I used Color Club Where's The Soiree as my black, as usual, and the gold is China Glaze 2030. This look isn't very Christmassy per se, but I love it anyway. So much that I might even wear it again for New Year's Eve ^^ Happy Holidays! I haven't seen this plate here but now I'll keep an eye on it, I really like the heart. :) Lovely manicure! I like this...maybe New Years Eve !!! I love that plate, the stars are stunning! Love it! I just got this plate for the holidays and might end up using it today!! Wauw, oh my. This is incredible, again, amazing! Preciosa manicura. Muy de Fin de Año. I really like this! So cute, but so simple and pretty! How pretty! I really like it! Merry Christmas! I have just discovered the insane shine that is Wet 'n Wild Wild Shine polishes. Looks great on you, and the stars are awesome! I'd seen this plate already and immediately added it to my wishlist. I think I'll eventually dig in and get it. Essence should think about releasing more plates, maybe one every once in a while as part of a TE. Pity they don't sell this separately. As much as I love butterflies and flowers, this plate seems more the way to go. Very modern and cute. Dear Mr. Essence, please release more image plates. I gotta have that plate! I love the "love," heart, stars and the other one that completes the square in the upper right corner. Where did you get this plate? I love it ! Very classy and fun in the same time ! Superleuk, die grote sterren! Goud en zwart vind ik altijd een supergoeie combi! 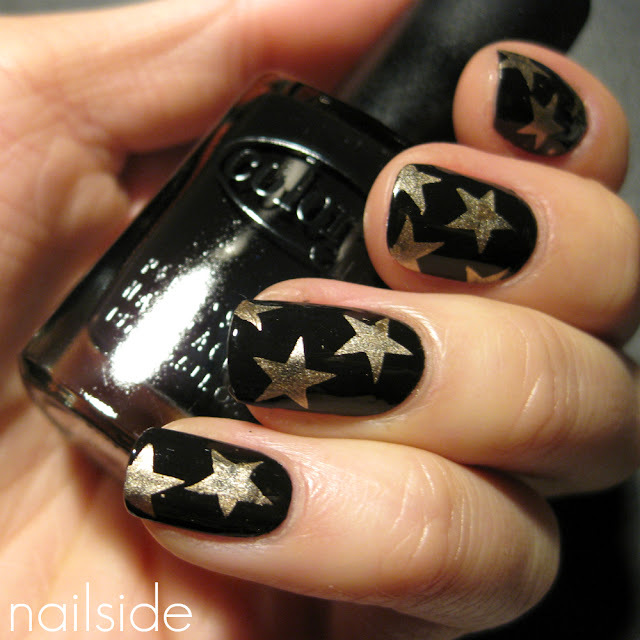 Awesome combo, stars on black are always good! Oh and yea, great design :) Simple, yet chic. Thank you guys for sharing your thoughts! ^^ Here in the Netherlands, Essence is sold at Trekpleister and Kruidvat stores, I got mine from the latter. @marox79: I totally agree with you! They really should release more plates, especially ones like this that have more modern designs instead of the flowers and butterflies that we already see so much. Where did you buy the plate? @paige: It's cute, right? ^^ Here in the Netherlands, Essence is sold at Trekpleister and Kruidvat stores, I got mine from the latter. Look gorgeous. Do you know where you can buy this plate in the UK? Or Even anywhere online that will ship it to the UK? @Danielle: Thank you :) Unfortunately Essence products aren't sold online :-( Wish they were! It would make maaany girls very happy. Beautiful look! I love this image plate. Wish I could get one here in the USA!